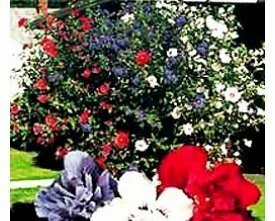 Rose of Sharon Althea - 3-in-one The 'Patriot' flowering Rose of Sharon is a specialized novelty plant combining our three patriotic colors of Red, White, and Blue. They grow 6-8' tall and bloom June through September. Extremely hardy, they thrive in any garden with little care. Size at shipping is 6-12 inches Shipped with some dirt intact mostly bare root. Some will arrive in dormant stage with no leaves on them.